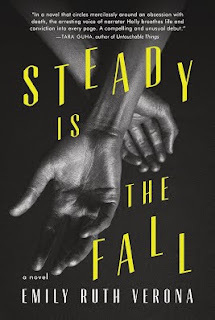 CELTICLADY'S REVIEWS: Steady is the Fall by Emily Ruth Verona Book Tour! Steady is the Fall by Emily Ruth Verona Book Tour! We were in a car accident as children. I was eight at the time and could never remember the details afterward. My cousin Larry remembered everything, even though he was two years younger than me. It might sound strange that a six-year-old would remember more than an eight-year-old, but it wouldn’t seem odd at all if you knew Larry. Larry never called it an accident. Not once. He referred to it instead as an imperfect moment or that time in the truck. Keep in mind this was coming from a boy of six, and then eight, and then fifteen, but Larry was incredibly articulate from the very beginning. Every phrase was deliberate with him—each letter carefully chosen. With such a gift for language and grace as a speaker, my cousin should have been a better storyteller, but he wasn’t. His descriptions were clear, but for some reason, Larry couldn’t milk it. He always started at the same spot—when we were in his father’s gray pickup truck, where Larry was seated in the middle between his father and me. It had been snowing all morning, Larry often explained, with tiny white flakes falling onto the windshield and dissolving the same as they do when they fall onto your tongue. It was still fairly early in the day though the clouds made it seem much later. Larry’s father had promised to take us out for lunch if we helped him in emptying out the garage. It was simple enough. He’d hand us something and have us run it upstairs to Larry’s mother in the study to see if she wanted to keep it or if the item could be thrown away. Larry and I made it a game, racing one another to see who could reach his mother first. Mostly we just tied, but I think I might have managed to win a time or two. By noon, we had finished with the garage and were out in the truck on our way to lunch to well-known and beloved Barkley Diner. The place had these dark brown seats, which looked like leather but weren’t, and the lights were yellow-tinted which made everything look like it was lit up by a warm, crackling fire. They served the standard fare. Burgers. Fries. Eggs. Pie. It could have been swapped out with any other diner in the country and no one would have noticed. And yet it was our very own place. The historic Barkley Diner. The drive only took ten minutes from Larry’s house, but to get there we had to drive along Redwood Road, which consisted of one wide lane that stretched through the woods and down beyond the park. The road was about six miles in length though we only had to travel about two of those before turning onto Wharton Avenue, which emptied into the intersection by the traffic light that sat opposite the diner. The trees, whose bare branches lurched overhead as we gazed out the window, were coated with a light brush of fresh snow. Everything seemed frozen and icy. It was the middle of October, but it looked more like December. That day entered the record books as the earliest snowfall Garner County ever received. I used to like to tell my friends that in school. It made me feel knowledgeable—powerful even. It’s strange how children grasp so tightly to what they cannot make sense of, finding importance in all the wrong places. Both Larry and his father remembered the radio as being on that afternoon, but only Larry knew the song that was playing prior to and following the accident. Stairway to Heaven. Larry was particularly proud of that little detail. After a point, he even became smug about it. Stairway to Heaven. Imagine that. He claimed it started about two or three minutes before the crash and continued amidst the static on the radio until an ambulance arrived. No one bothered to turn the engine off. It just kept on playing all the way through. When the paramedics arrived they took me away. Larry wanted to sit in the ambulance with me, but they drove us separately, claiming my injuries to be more severe. Whether Larry’s disappointment in not being allowed to go with me came from a concern for my safety or his fascination with the blood, I’ll never know. It was probably a little of both. Afterward he swore it was because he was worried about me. He was always a rotten liar, and since I believed him it was most likely true. Or maybe I just wanted to believe him. Too much has happened since to ever really know. Larry sprained his arm in the accident, but other than that there was little harm done to him. He was always disappointed about that and at first, his parents took that disappointment to be displaced guilt; they thought he felt ashamed to have gotten away with barely a scratch. But really he was just disappointed that he hadn’t experienced more. Felt more. The accident wasn’t nearly enough to settle him. The doctors did their work and were proud of my recovery, given that my injuries were more severe than they at first suspected. I received a concussion from hitting my head and one of my lungs collapsed in the ambulance. The latter actually served me well in later years. I was able to avoid my parent’s insistence that I join the soccer team that spring, and in high school, it got me out of having to run the mile required to pass gym. The cold weather sometimes made my chest ache and I couldn’t breathe well after running, but those doctors considered me lucky. I could have died. Larry used to say that all doctors tell the parents of surviving patients that their children were lucky. He thought it was nonsense. There was nothing lucky about it. For years I thought I understood what he meant. Only later did I realize that I was wrong. Larry clung to the particulars of that afternoon. They mattered so much to him, and so in time, they began to mean a great deal to me as well. His memories became mine. His story did, too, and for a while it looked like that was all the accident would be: a good story. Those involved recovered, even the other driver who suffered nothing beyond a split lip. No one pressed charges. No one died. The flesh healed quickly. At the time, it looked as if nothing much had changed. Only later did we come to realize the extent of the damage it had done. My parent’s never let Larry’s father off the hook, even though it wasn’t his fault. The fact that guilt nearly drowned him became inconsequential. No one seemed to notice that it was only after the accident that he started drinking again. It didn’t matter, not to my parents. At the time, I was an only child and my mother maintained that nothing ever scorched her soul like that phone call informing her that her lovely little girl had been brought to the hospital. It was the last time she ever took the trouble to care about me as a mother. In that respect, the accident also did me good. I knew from that afternoon that she loved me and I remembered it when she left my forty-five-year-old father for a twenty-six-year-old physical therapist in Florida. I remembered it when she stopped visiting. I remembered it when she stopped calling. For the rest of my childhood I had the comfort of knowing that for one day as I lay on the very verge of death, my mother truly loved me. That love was so strong that it scorched her soul. Some people might have needed more than that, but I considered it to be plenty. It was more than my father had. It’s more than my brother, who was only three when she left, was ever likely to receive.